Overview: Do you need to manage multiple sites, multiple sweeps, and report on multiple projects? Anritsu Line Sweep Tools is free PC-based software designed to capture, validate, and report on line sweeping activities. It speeds the report generation process by capturing files from many different Anritsu cable, antenna, and PIM sweep instruments, verifying that the traces meet requirements, facilitating trace, title, and subtitle renaming, and making report generation simple. Who should attend: Contractors and technicians using Anritsu devices for performing cable, antenna, and PIM sweeps and needing to submit a report on those activities should attend this webinar. What you will learn: Find out how to shave hours off your line sweep report preparation time using Anritsu Line Sweep Tools. 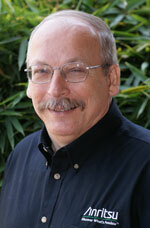 Tom has 19 years experience in the telecomm industry working with RF and Cellular technologies. Tom has concentrated on Test and Measurement for cellular base stations for much of this time. Tom is a Product Manager for Anritsu Company with worldwide responsibility for wireless service providers. He focuses on improving network performance and making technicians more productive through the technologies and tools of Anritsu. Tom has taught hundreds of technicians, written several procedures and courses, and regularly receives the input of technicians, managers, directors, and CTOs on new test requirements as the wireless network evolves.